A home renovation involves a lot of materials. 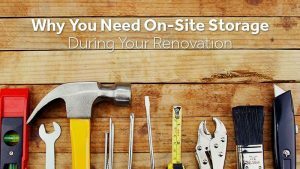 From new construction supplies like tile and boards to replacement furniture and additional décor, you have a lot of large items to juggle around your busy renovation schedule. Unfortunately, the average garage just isn’t big enough to accommodate all these materials. The good news is that there is another effective option — an on-site storage container that you can rent during your big renovation project. Here’s why a Zippy Shell container may be just the solution you need during your renovation. When you are short on storage space, it can make planning out your renovation very difficult. Should you order that new sofa now and hope the floorboards have been cleared out of the garage by the time it gets here? Leaving furniture or supplies outside is just not an option. Fortunately, a storage container can solve these problems by giving you extra space to store those cumbersome supplies while certain rooms in your house become temporarily unusable. Another problem with trying to store anything outside is that the weather may not play nice (not to mention pests and rodents). You don’t want to risk any of your furniture or materials that way. Fortunately, a storage container provides an easy way to store all those items without worrying about the weather. 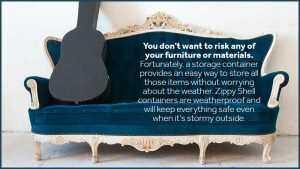 Zippy Shell containers are weatherproof and will keep everything safe even when it’s stormy outside. Zippy Shell always provides containers that are very easy to move and position close to your house. This is especially handy for DIY renovation. You shouldn’t underestimate how much easier everything is when you can go retrieve supplies or tools in just a few seconds, rather than trying to keep everything in a truck or other less manageable storage options. In addition to worrying about the weather, you don’t want to keep any of your renovation items where they can be stolen or vandalized. Our containers are secure and allow you to protect important belongings, even if you have to leave them alone for a weekend or two while you are busy taking care of other business. You Don’t Have To Bug Your Friends! It may seem like a smaller advantage, but it’s true — if you have your own storage on site right next to your home, you don’t have to keep asking friends for help with storage and transportation. It’s a great way to avoid annoying people! Looking for a dependable temporary storage or transport solution for your home or office? Check out more information about how Zippy Shell works and fill out a quick form for a free quote! Give us a call at Zippy Shell Greater Columbus to get started.